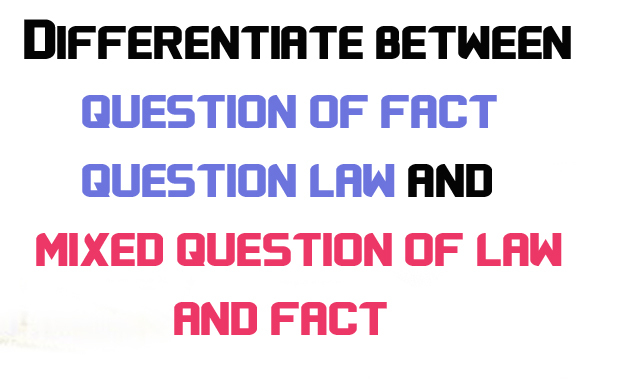 Question which arises for determination before a court of law are either questions of fact or questions of law or an admixture of both, known as mixed question of law and fact. A question of law is one where answer is already prescribed by some rule of law. Thus the question as to what is the reasonable and proper punishment for murder is a question of law. In such cases the judicial opinion is excluded and discretion of the Judge ruled out. The question as to what law on particular point is such question arises where notwithstanding the existence of law on the point, it is dubbed with uncertainty. Such a state of affairs is a matter of common occurrence because the language of the statute is always capable of various interpretations and it is in this sphere that the lawyers play the most important role. So, interpretation of a particular provision of law is a question of law in this second sense but once it has been interpreted either way a superior court it becomes a question of law in the first sense. In jury, trails, such questions as are to be answered by the judge are named questions of law as distinguished from those which are to be answered by the jury and which are called questions of fact. 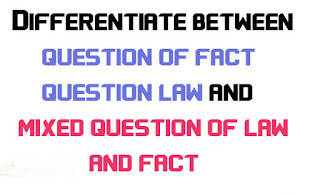 This classification of the definition of question of law is however incorrect because the judge may often determine questions of fact also but for that mere reason such questions would not turn out to be questions of law. iii. Any question which is to be decided by the jury and not by the judge, are question of fact. In its restricted sense the terms mean a question of fact a opposed to a question of judicial discretion. Thus, whether in a case of breach of contract the plaintiff should be allowed specific performance or merely left out with compensation is a question of discretion. Or where matters of opinion arise before the court, the court has discretion to adopt whichever view it deems best suited the circumstances of the case. In such cases, however, no rule of law is applicable and it would, therefore, be appropriate to call them; questions of discretion;. i. Questions of fact are question of what actually is. Questions of discretion are questions of right or what ought to be. ii. Questions of fact are to be proved by evidence and demonstration. Questions of discretion are subjects of reasoning and argument. iii. In questions of fact, the court seeks to find out the truth. In questions of discretion, the court’s aim is to determine what is just. As we have already seen, in the primitive stage of society, the basis of decision was the sole discretion of the judge, unfettered by any fixed rules or principles. With the advancement of society fixed principles or formulae came to be evolved and the judge had to follow them but these principles being general and vague left much room for the exercise of judicial discretion. Later, elaborate and all covering statues were framed but these again due to their being expressed in language, which is an unruly horse and capable of being interpreted in various ways, still left sufficient room for the judge to exercise his discretionary powers. The state of affairs exists even to this day. But with the development of society and growth of law, the discretion of the courts is gradually being curtailed, firstly, by liberal enactment of statutes and secondly, by previous judicial decisions and authoritative opinion. The developed legal system aims at exclusion of the moral judgments of the courts and to compel them to decide cases, not according to their discretion, but according to fixed principles. To achieve this end, decisions of superior courts are permanently preserved in Law Reports and courts are bound to act according to the rules laid down therein. In this way, what were formerly mere questions of discretion are converted, at a later stage, into questions of law. Likewise, questions of fact may also at a later stage be converted into questions of law. “The law is the theory of things as received and acted upon within the courts of justice and this theory may or may not conform to the reality of things outside. The eye of the law does not infallibly see things as they are partly by deliberate design and partly by errors and accidents of historical development, law and fact, legal theory and they may not be treated by law to be so or, in other words, law is discordant with facts in many instances.